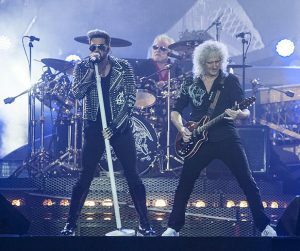 The internet was on fire all weekend long with reports of Queen + Adam Lambert’s arrival by helicopter and their incredible performance at England’s Isle of Wight Festival, with 58,000 in attendance. This was after the horrific shooting at Pulse in Orlando, Florida. Both Queen + Adam Lambert made their first appearances at the renowned Isle of Wight Festival in Newport, England on Sunday, June 12th. With six dates left to the current European tour, they’re heading to Belgium on June 15th, then Switzerland, Poland, Romania, Bulgaria and finally Italy on June 25th. The following review is full of pictures and fan tweets, which you can see when you click on the link the end. Here’s a funny bit – they had a Pizza Rider for the gig! See it here! Add your comments if you’d like to see Queen + Adam Lambert return to the USA! Queen and Adam Lambert closed out the Isle of Wight Festival 2016 with a blistering set that included a poignant tribute to the victims of Orlando’s mass shooting. The artists took to the stage at Seaclose Park on Sunday, 12 June as the hugely anticipated final headline act of the weekend, which had seen the likes of Stereophonics, The Who, Faithless and Jess Glynne perform. Remarkably, it was Queen’s debut performance at a UK festival – despite forming way back in 1970! He first met Queen during American Idol, when Roger and Brian May performed with him in the finale. (Adam had performed ‘Bohemian Rhapsody’ during the audition stages.) Adam later joined the band for a one-off performance at the MTV Europe Music Awards 2011, before officially joining as new frontman. They flew in via a personalized helicopter emblazoned with the words Queen + Adam Lambert – talk about making an entrance! And, as always, Mr Lambert was looking oh-so-stylish in his all-black ensemble and sunglasses. As the group arrived on stage, footage was played showing them backstage, gearing up for the big moment. Then, the curtains bearing the Queen logo dropped and they emerged in a sea of red light and insane energy from the audience, and launched straight into ‘One Vision’. All the classic Queen tracks were on display from ‘We Will Rock You’, ‘We Are The Champions’, Radio Ga Ga’, ‘Fat Bottomed Girls’, ‘Under Pressure’ and ‘Killer Queen’, to ‘Who Wants To Live Forever’, which was dedicated to the victims of the Orlando nightclub shooting. Click here for the rest of the review, including pictures and fan tweets! Click the following titles for additional reviews. *Editor’s note: Don’t worry about the first title! Thanks Carol…..this has been so much fun reading and listening to Adam and Queen. So sad about the tragic shooting in Orlando. I worry everyday about the world. No one is safe. I pray for Adam’s safety as he travels all over the world full of haters and nuts who think they have a right to destroy lives. I’m glad he stands up for what he believes and I hope he performs for a very long time. Anything that is remotely connected to Adam Lambert is always of interest to me. I started with my Adam adoration when I first saw him on AI. It’s all about the voice for me although he is excellent eye-candy. It’s been a sheer pleasure watching him grow & he has (and is) growing up beautifully. It is always good to see Adam anywhere! So sad about Christina Grimmie too! And then the horrible thing at Orlando. Just makes me want to cry! Thank you Carol for the good news about Adam! I always love to hear anything about him! Please come back to Toronto in Canada or to Detroit in the USA!! I missed your last tour here and have been sorry ever since!